There is currently a considerable interest and level of activity in developing computational schemes to predict general engine dynamic behavior. The general feeling among researchers working on engine vibration problems is that various modes of operation, such as blade-loss events, require a high level of analysis sophistication to realistically model the engine. Proper account of system nonlinearities (particularly at the bearings, dampers and rubs) appears to be necessary if analytical predictions are to be realistic. The approach described in this paper seeks to make use of already proven general finite-element nonlinear time-transient computer codes which are available on the open market. The work specifically described in this paper covers the first phase of a three-phase NASA-Lewis-sponsored research grant on engine dynamic simulation with available finite element codes. 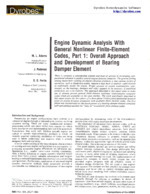 The first phase was concentrated on the development of a bearing-damper element computer software package suitable for “plug-in” to available finite element codes.